We feel it is important to have a close-knit relationship with our local community. Over the years we have cultivated partnerships with many community organizations such as the City of Duluth, the Gwinnett Chamber of Commerce, and the Duluth Merchant’s Association. 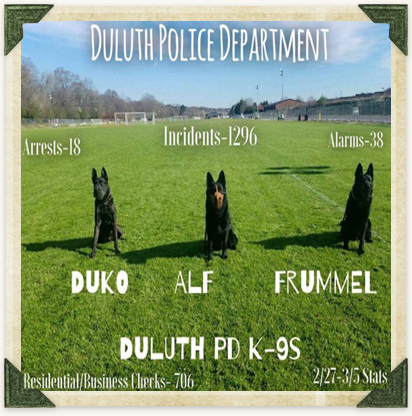 We are honored to support the Duluth Police Department by providing veterinary care for their canine unit. We have a mutually-rewarding relationship with these canine officers and their handlers. We keep them in top health so they can continue to keep our community safe. 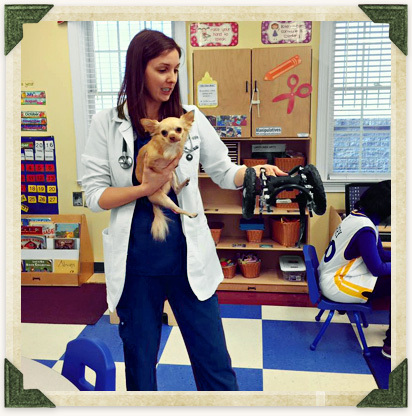 We are a founding partner of the Gwinnett Technical College Veterinary Technician Program. We provide students who are completing their studies to become a certified technician an externship program at our hospital facility. During this program, we train students to become proficient in a clinical atmosphere and learn up to date medicine and techniques. We also offer a shadowing program for middle school and high school students with an interest in the field of veterinary medicine. These students can watch veterinarians perform exams, surgeries, and other medical procedures so they can learn more about what veterinary medicine has to offer. Often students can incorporate these experiences into a student work program for community service or job experience. For younger children, our doctors visit local Duluth Schools with ambassadors Roo & Penny Chicken to talk about what it’s like working with animals and to share the duo’s unlikely but loveable friendship. 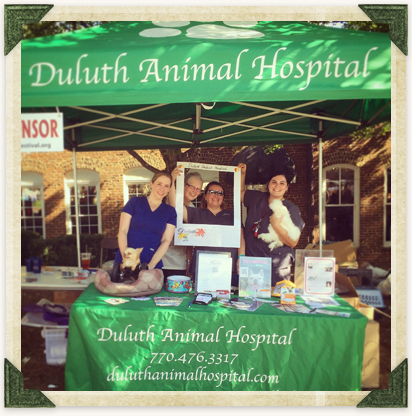 The Duluth Fall Festival is an annual event that fills up the heart of downtown Duluth in walking distance of our hospital. For nearly two decades our staff has welcomed this opportunity to meet new people and say hello to our clients and patients! It is a wonderful time and we invite you to come see us this year. We work with Angels Among Us and Furkids, providing high-quality care to rescue organizations. We also provide free exams to all newly-adopted shelter animals.